Please note: This is a download card, not a CD. 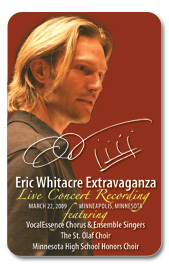 Hear the world premiere of Eric Whitacre’s Nox Aurumque on this uniqute live recording of the complete “Eric Whitacre Extravaganza” concert. Choral superstar Eric Whitacre conducts the VocalEssence Chorus and Ensemble Singers, joined by The St. Olaf Choir and the 160-voice Minnesota Honors Choir, in a performance featuring many of his greatest hits. This performance was recorded live in concert at Orchestra Hall on Sunday, March 22, 2009. All works by Eric Whitacre, unless otherwise noted.